So You Think You Can Mom? 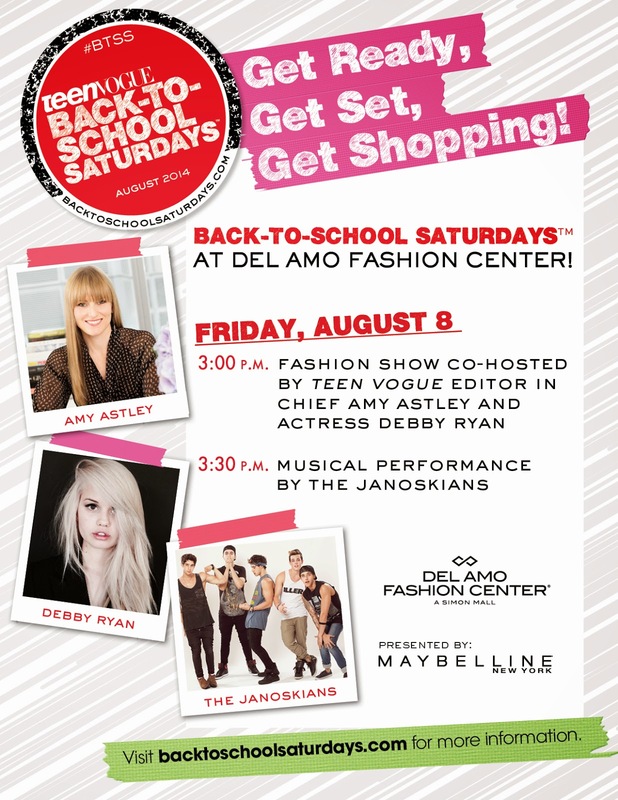 : Get BACK TO SCHOOL Ready at Del Amo Fashion Center! Get BACK TO SCHOOL Ready at Del Amo Fashion Center! Teen Vogue Editor in Chief Amy Astley, along with cohost Debby Ryan, star of Disney Channel’s Jessie, welcomes thousands of fashion fans to the Del Amo Fashion Center in Torrance for the Teen Vogue BTSS kickoff. The event will feature a Teen Vogue fashion show with the hottest back-to-school trends for fall, curated by the editors of Teen Vogue, bringing the pages of their fall fashion issue to life. Immediately following will be a “plaza pounding” performance by the Australian group The Janoskians. Access is free to the public and available on a first-come, first serve basis. Due to demands/space attendees must have wristband for entry. 5,000 wristbands available. One per person. Wristband distribution (each guest must be present to receive) will take place Thursday, August 7th at Del Amo Fashion Center in the North parking structure (at the corner of Fashion Way and Del Amo Circle East). Public may start lining up Thursday, August 7 at 6am with Wristband distribution beginning at 8am. No one will be allowed to lineup prior to 6am on Thursday.